I get this a lot. People contacting me on social media, commenting on the ‘dream life’ we appear to be living out here on the land. In most cases, it truly is, but I find the hardships of this life are often missed in those twelve perfectly colour-coordinated squares and fifteen-second story snippets. So, in response, I thought I’d use this opportunity to shine a light on the not-so-romantic realities of life on the land, in a shed, with a toddler and a whole lot of big plans to get done on one (and a bit) income. Photo by Maggie McGowan, Winnie Duncan from Urapunga, wearing Graham Badari's Nabarlek dja Ngarrbek (Rock Wallaby and Echidna) print. A social enterprise run by two creative women is bringing fabrics of Northern Territory indigenous communities to the world. Magpie Goose NT is the brainchild of Maggie McGowan and Laura Egan, two young entrepreneurs based in Katherine in the NT. 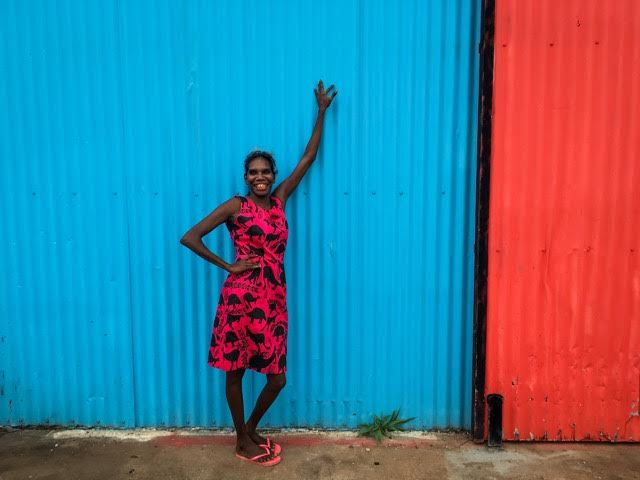 Maggie and Laura work with Aboriginal art centres in four communities - Wadeye, Gunbalanya, Tiwi Islands and Maningrida - to produce screen printed fabric, designed by local artists, to be made into women’s, men’s and children’s clothing. The name is a nod to the classic northern Australian bird, known for its distinct look and quirky behaviour. Maggie came up with the Magpie Goose concept during her travels to indigenous communities in the Territory, working with Aboriginal legal aid. “I started discovering art centres, particularly the bright colours and patterns of the fabrics made there, and how they told incredible stories of that community,” says Maggie. Feeling disheartened by the underemployment in communities Maggie knew she wanted to contribute in a different way, other than through her legal work. She and Laura pitched their case to Enterprise Learning Projects (ELP), an NT-based organisation supporting inclusive businesses in indigenous communities. ELP funded them to buy 200 metres of fabric to start the production process. Maggie and Laura went to Bali and had a handful of garments produced in simple designs and started wearing the pieces themselves. At the end of 2016 they did a ‘soft’ launch in Darwin, before all their friends went down south for Christmas. They sold the majority of their pieces, and their customers wore the Magpie Goose garments over summer in other parts of the country, building further interest in the bold designs. Each design tells a story of people, place and culture. A lightning bolt moment came when Laura was chased through San Francisco airport by people asking her where her clothes were from. “We then realised that there was a big demand for it,” says Maggie. The pair started a Kickstarter campaign and reached their target of $20,000 within 24 hours, ending up with over $100,000 of pre-orders. An important part of the business model is ensuring opportunities for Aboriginal people to be involved, and Maggie says they hope to involve people from the communities that the fabric is produced, through writing stories of the artists and designs; modelling the garments; and liaising with the media. Maggie says that eventually she’d like to have people in each community employed by Magpie Goose NT. Kate Shannon is a freelance writer based in Brisbane after many years living in Darwin. She spends a lot of her time in the garden with her two little girls, and loves writing and learning about creative people, families, flowers, and plants. Jasmine Mansbridge is an ongoing contributor and supporter of CWC, and an artist with an upcoming show at Koskela in Sydney this year. In the often intimidating art world, Jasmine would be considered an “outsider artist,” a term used for people who are untrained, without a formal art school education. However, as you’ll read from Jasmine’s contribution below, her training has been gained through mentors and life. And, like many other “outsider artists,” she is generating a swirl of supporters and attention through sheer drive, visibility, and consistent, passionate determination. With no formal fine art education, you are very much an “outsider artist,” as the industry likes to say. How has your journey as an artist transpired? Tell us about finding confidence and courage in your style, and why painting has become your passion. My overall naivety about the art business reveals itself to me more and more as time goes on. It was around this time last year that I was referred to by a gallery as an outsider artist. This was the first time I became aware of the term. I think if years ago—when I started painting—I had known what I know now about the complexity of the art world, I would have been too overwhelmed to feel I could ever experience success as an artist. My desire to be an artist has been built by the practical application of creativity. I became pregnant at age seventeen, and at the time I was living in Katherine in the Northern Territory. There was no internet, no phone, and often no transport. I lived away from my parents while all my friends had typical teenage lifestyles. I was determined to be the best mother I could, so I began painting as a way to channel my frustration and loneliness into something positive. I would be home painting while everyone else I knew was out. My painting sustained me and gave me a way to express myself. In those early years, I was encouraged by older, established creative people within the Katherine community. This is one reason I love to share with people, because I am proof that creativity can bring so many good things to one’s life. My growth as an artist has been largely organic. I am big on taking opportunities presented to me. I have so much to learn, but I have always figured I will only learn by doing. I think that the hard thing about being on outside, is getting on the inside! How did you arrive at your medium? Has painting always been your creative outlet? Expand on finding painting and the specifics of the medium (such as acrylic on board). When I first started painting, it was with those tiny tubes of acrylic you could buy from a newsagent, and watercolour paper. I still have some of those early works. I was encouraged to paint by my in-laws at the time. They run an Aboriginal art gallery in Katherine and began giving me linen off-cuts and basic paint colours. This is where my obsession with quality art materials began, because it makes all the difference to a piece. It wasn’t until I started to sell work and buy it myself that I realised how much it all cost. If you know someone who likes to paint, why not buy her some good stuff? It makes such a difference. I have always painted with acrylics because I’ve always worked within the home environment. They dry very quickly and don’t have the smell that oils do. They also work well with my style and allow me a lot of control. I love to paint on linen as it is such a beautiful product, but I also work on board, and on paper for smaller works. In saying that, this year I plan to experiment with oils to see what they do visually to my style. With a growing number of solo exhibitions, a book, public murals, and a pending exhibition at Koskela later this year, how do you divide your time while still being present to your family of five? It is answering this question that led me to write my book, There Is a Paintbrush in My Coffee. In the book, I talk about all the ways I have learnt to work over the years. This year will see a massive shift with the oldest two (20 and 17) away at university, two in school, and only one (my crazy two-year-old) at home. So I am planning on taking on a bit more this year commitment-wise. Exciting times ahead. My husband has a job that sees him working long hours, especially at this time of year; we are both ambitious in our own way. But me working from home means I am also running the home. It is a challenge, but I have come to accept that it always will be. To be working creatively is a great gift, something I am aware of and grateful for daily. My greatest asset, I think, is to be able to mentally “turn on a dime” and paint productively in short spaces of time. If I have an hour I use that hour. You have to develop and nurture that skill. My biggest tip would be to get a space to work where you can leave your work—even if it is just a corner in your bedroom (where I worked for many years), or a drawer in a cupboard. Doing this means you are able to maximise your work time and not waste it setting up or packing up. Being creative is such a wonderful way to relax, to order your thoughts, to challenge yourself, and to express yourself. It is a way to add value to your life. Your work continues to progress. Who are your influences and inspiration and how important have mentors been to you? I was a child who grew up without a television and I spent many hours drawing. My grandmother was an artist and she worked in a studio painting portraits, amongst other things. I was always disappointed at how my pictures looked compared to hers, so early on I tried to find my own way of visually representing things. I remember being awestruck the first time I saw mosaics, and I have been obsessed with pattern and repetitive design for as long as I can remember. These elements have always been present in my work in some way. While still in Katherine (which I left when I was twenty-six), I spent time with established Indigenous artists. Their use of pattern, and their patience and devotion to their work, resonated deeply with me. I learnt a lot about the life of an artist, and how important it is that it be tailored around the work. My life is like that. My life and my painting are not separate but the same. I have always felt greatly moved in nature and had a connection to the physical world, and this—as well as storytelling—are all aspects of my work. This philosophy has seen me ride the highs and lows of the “career” side of my life well. At the end of the day, I would make work with or without an audience. While commercial success and sales are important because they enable my work—and me—to grow, I often remind myself that to do meaningful, connected work, I have to be meaningful and connected to my work. Otherwise it will become empty, repetitive, and meaningless. In the last few years, social media has allowed me to connect with a wider audience and has given me some wonderful friends and mentors. I am grateful for this and I definitely do not feel the isolation I once felt as an artist living in a regional area. 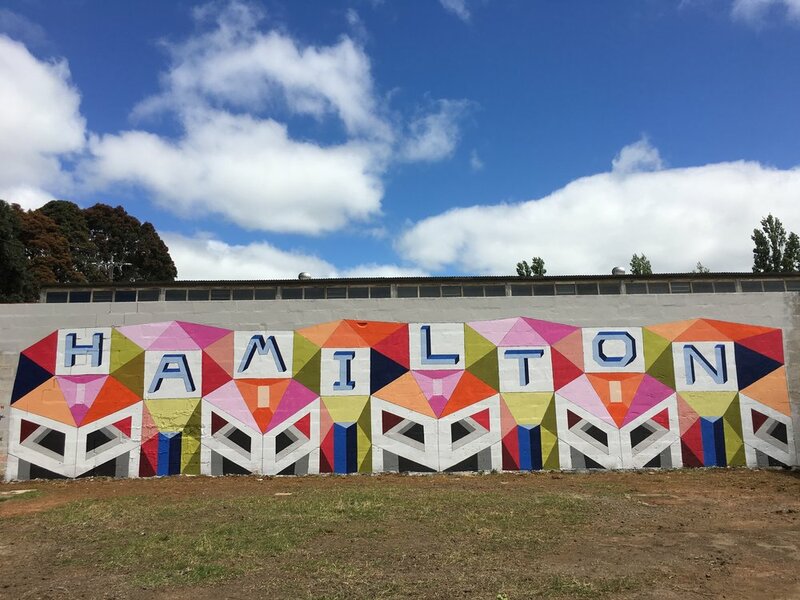 There are also more creative people living and working in my local area (Hamilton, Victoria). I think we are in exciting times for regional centres as new hubs for creative growth, perhaps due to cheap living costs and the internet making the world a much smaller place. You mentioned M.C Escher; he is certainly an artist who I have long admired. I also love the suburban paintings of Jeffrey Smart, the Australian artist. They say something about the artistic quality of the man-made world. Of artists working presently, I think Ghostpatrol (David Booth) does interesting and clever pieces, as does Miranda Skoczek. I have a friend here in Hamilton, Grotti Lotti, who is making beautiful work as well. I love a lot of art, but it is the paintings I remember that impact me. That is my measure of good work: the images that stay with me long after I have seen them. Patti Smith has influenced my thinking a lot in the last few years. Her thoughts on the culture of celebrity have got me thinking about this within the art world, and her simple advice to just “do your best work” resonates with me time and time again. You have a big exhibition at Koskela in Sydney later this year. How did you secure your gallery exhibitions? What are your top tips for other artists trying to establish themselves and secure gallery exhibitions? I am really looking forward to showing at Koskela. I remember going to a Rachel Castle workshop there in 2012, thinking how much I would like to exhibit there. Like most things I do, the time between the seed of the idea and it actually happening is usually a long time. I don’t have time or resources to pursue a broad range of ideas, so I generally pursue only a couple important ones. I actually flew to Sydney this time last year to meet with the art director and show her some work in the flesh. This was after some time spent sending emails back and forth and developing connections there. Anything worth doing costs something, and finding places to show your work is no different. For a long time now, all the money I make goes back into the work, so I am able to make bigger and better things happen. Then, of course, you have to do the work. Every door opens another, so to speak. I want to keep making the work better to prove myself worthy of the next project, and so on. I say this all the while aware that I am not yet where I would like to be career-wise, and knowing that I have to take my own advice and be patient and consistent. My advice to younger creatives is to get out and say “hi” to your heroes. You won't connect with everyone, but you don’t need to. Be yourself, but the best version of it. If you want to work with someone, reach out and tell him or her. The world is so small now; with social media, you can chat to almost anyone. My favourite thought of late, which keeps me going when I am clueless, is this: No one has been me before. It’s very simple—scary, almost, but true. No one has been me. I can only make choices about what I want to do. I cannot follow, emulate, or duplicate another person’s career or life. I can’t live off someone else’s advice or example. It is a powerful truth. You have only failed when you have quit, so keep working. Creativity is a long game. As I said above, it is inextricably linked with your life. Do your best work and get it out in the world. Lastly, how important are your support networks? And what is some of the best advice you received when you were establishing yourself? The Creative Women’s Circle came into my life at an important time, when I was feeling like I needed to link into something bigger than myself. Because I live regionally, work from home, and work in my home as a mother, I can feel isolated. Through CWC, I was able to meet people I would not normally meet. Blogging for the CWC helped me clarify my thoughts on many things, and cement my feelings about being a professional creative. I recommend membership to everyone I meet, as it is an invaluable resource and support system. To see more of Jasmine’s work, visit her at jasminemansbridge.com. She can also be reached at jasminemansbridge@yahoo.com.au. Annette Wagner is a designer, marketer, creative consultant, artist, and writer. She is also on the board of the Creative Women’s Circle. Obsessively passionate about the arts and the creative process, she is determined to not talk art-speak and instead focus on supporting and sharing concepts and insights most creative types crave to know. Tara Pearce is one half of Erin & Tara, a wedding photography business based in Kyneton, in the Victorian Goldfields. Erin & Tara have only been in the photo business for five years, but are in demand to capture the special days of couples all over Australia. You can find them on Instagram and Facebook. First up, tell me about where you live. Have you always lived 'out of town'? I live in Kyneton with my husband and two children. It is about a one hour drive from Melbourne. We have been here for eight years now. I spent time living in Kyneton when I was a child and my husband grew up here, so we both have a long term relationship with the place. It's been a great place to raise our two children Yorke and Mak, they are very established and happy here. It is far enough away from the city to be removed from it, but close enough to do business. My husband commutes there for work on a daily basis. What is your employment background Tara. Can you tell me a bit about that? Well I initially did a business degree and worked in the public sector. Our photography journey started 5 years ago when Erin & I thought it would be fun to photograph a wedding! This was before we owned a camera let alone knew how to use one. Let’s just say Google is our best friend! Seriously? How can you have only been in the photo business for five years, that is crazy. You have done so well. How did you go from a city job to self employed creative. What did the transition look like? Well initially I met a stylist, and I became a styling assistant. That only lasted a few gigs as the whole time I was watching the photographer and realised photography was something I would like to do. I was good friends with Erin and we started talking about it one day saying, this wedding thing, we could do it. We shot our first wedding together 3 months later and it all started from there. The biggest challenge was learning the technical side such as how to use a camera. Each year has had it’s own turning point from personal achievements such as creative growth to learning how to accept rejection gracefully. I believe the key turning point for us was when we started to trust our own judgment and abilities, which lead to more confidence giving us the freedom to express our creative vision. In our first year we shot 30-40 weddings, the two of us with a camera each, so we could double our chance to achieving our vision and nailing the shot. So five years on what has changed in how you do business? After the first year of shooting weddings together we where pretty confident photographers and so we decided to shoot wedding individually. It works really well as that way we can commit to other individual work and family life. For example I generally take destination weddings while Erin prefers local weddings as she has younger children. These days we also have a team of talented assistants and we are about to launch a wedding photographer agency. Can you tell me what has been your biggest challenge for your business? Finding a good work/life balance! We are slowing finding a way to switch off from all the emails, but in the first three years of our business, we felt like we had to be 'on call' and sometimes I'd find myself emailing clients back at 2am. Crazy times! Not being photographers from the start meant having to learn all the technical stuff which was very daunting but together we worked it out. To be honest we learn something new every day, it's a pretty exciting industry to be in. What about Erin & Tara are you most proud of ? Looking back and remembering the conversation we had in a local cafe about becoming wedding photographers, that was five years ago and seeing where we are today! This is an achievement one we are very proud of. A lot of hard work, persistence and support from our amazing husbands! I'm also a massive believer in the Universe providing what you need when you need it. Jasmine Mansbridge is a painter and mum to five kids. She regularly blogs about the intersection of creative work and family life, as well as her recent projects and travels. You can also find her on Instagram.